The American frontier was a legend, even as it was happening. Gunfighters, Indians, cowboys, miners and mountain men . . . the "rust-eaters" who pushed the rails west . . . the Pony Express . . . the Texas Rangers and the outlaws they fought . . . the settlers battling fire, floods, stampedes and sickness . . . their adventures made the nation what it is today! All the classic character types: the Cowhand, the Dude, the Gunslinger, the Doc, the Gambler, the Outlaw and the Lawman . . . even the town drunk. Descriptions of authentic Western weaponry. Maps showing the Westward expansion, trails, rail lines, and more – and a detailed timeline of significant events. Descriptions of Indian tribes . . . and rules and spells for Indian magic! 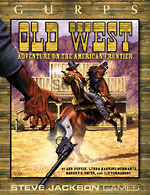 Legends of the Old West . . . to come alive in your campaign. The battles that shook the West, from the Indian uprisings to the Civil War. Come West if you've got the guts for it. The weak die on the trail, and the cowards never leave home. Let's see what you're made of, pardner . . .
GURPS High-Tech – Descriptions and stats for hundreds of kinds of historical weapons and personal armor, vehicles from the stagecoach to modern helicopters, and much more. Pyramid #3/74: Wild West – A collection of Western-themed articles for GURPS Fourth Edition.